It’s barbecue season, y’all! When it comes to entertaining, barbecues are the perfect opportunity to fire up the grill, try out a few crowd-pleasing recipes, and set up a festive dinner party for neighbors and friends. 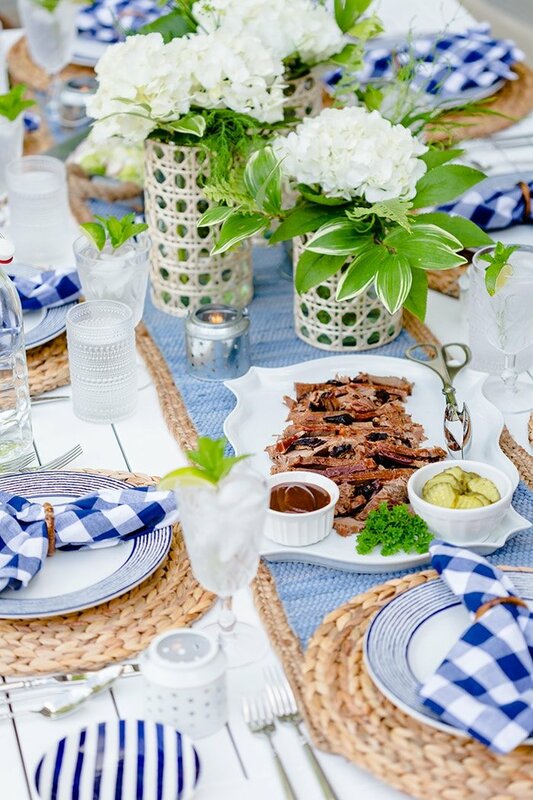 So, sit back and check out my 7 tips for throwing the perfect barbecue, and you’ll be hostess-ready in no time! Let’s focus on the most important part of the barbecue – the food! 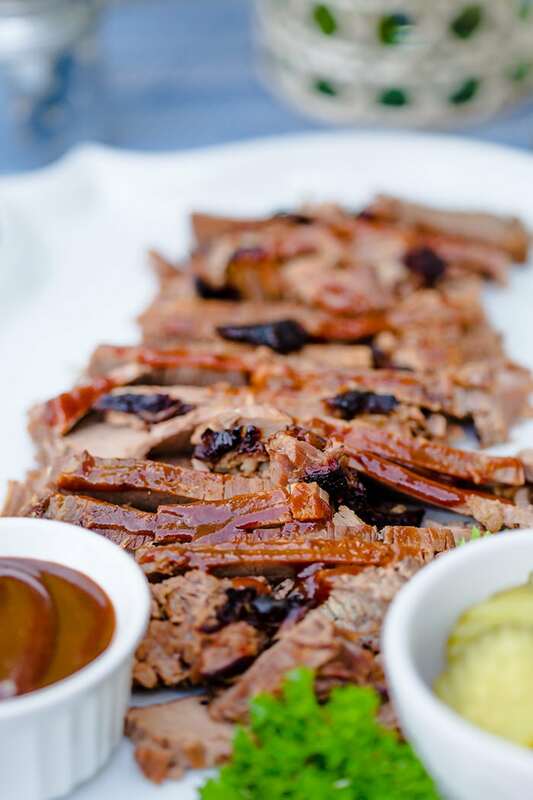 My favorite dish to serve is a show-stopping Texas BBQ Beef Brisket! I was born in Texas, and I like to think it brings me back to those Lone Star roots. Beef is always a hit at my parties, especially when you use a delicious, high-quality cut of meat. For this brisket, you’ll want to find a brisket flat-half. I love to serve mine as-is, but it’s also perfect on buns or in tacos to mix things up! You can visit the Beef. It’s What’s For Dinner. website for the full recipe! Beef is a nutrient-rich, high-quality protein raised with care and dedication by farmers and ranchers. I love to support them, especially when it means serving up one of my favorite dishes at my summer parties! It’s a very versatile protein with so many ways to prepare it (roast it, sear it, grill it,), so I hope you’re inspired to create your own summer menus with beef! 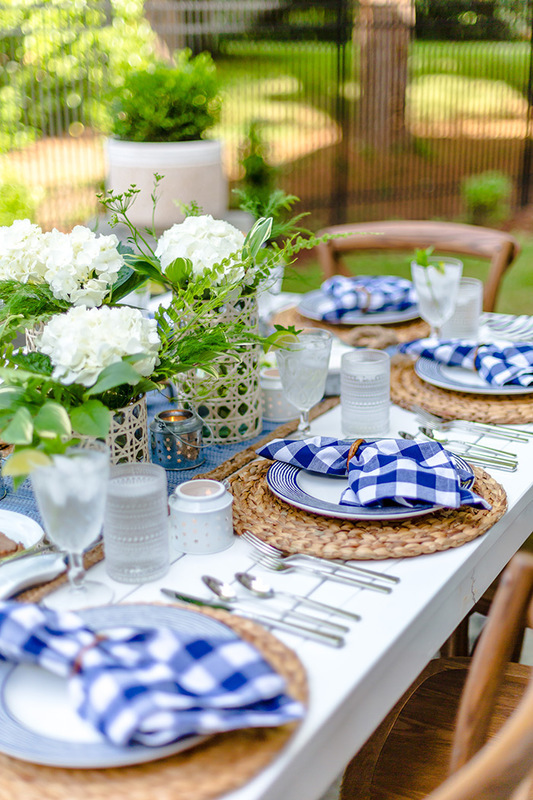 I love the Americana feel of patriotic colors all summer long, so I focused in on blue and white for my backyard barbecue. Whether it’s red and white or a combo of red, white and blue, these colors are perfect for summer. Keep your color scheme in mind when selecting your décor, from napkins to flowers to give your party a cohesive look and feel! 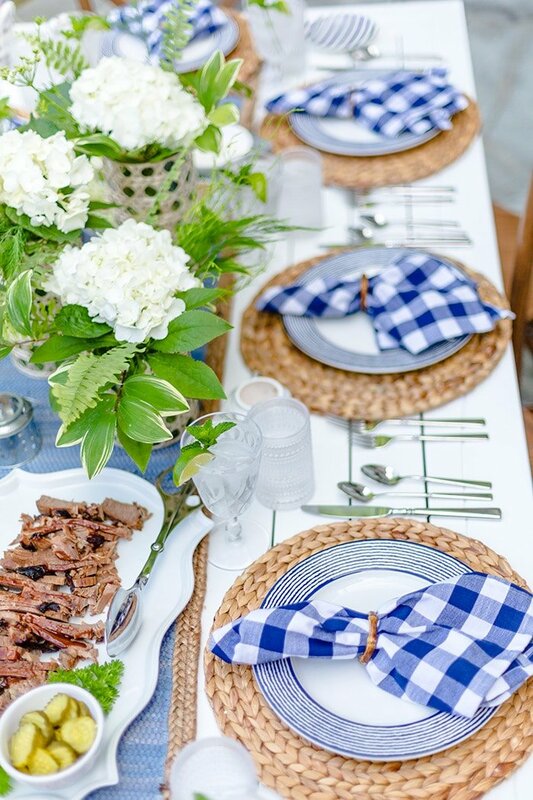 Since the meal is my favorite part of any barbecue, setting the table in a beautiful display is at the top of my list! I clipped white hydrangeas and greenery right from my garden to place on the table. 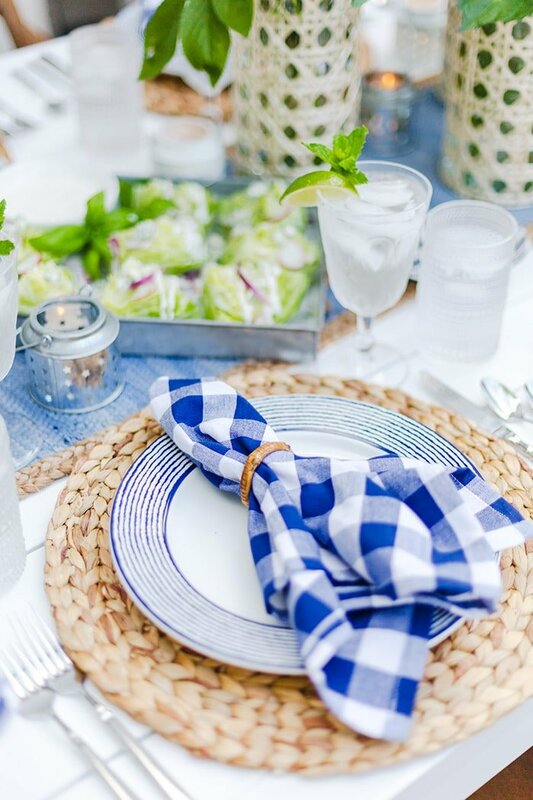 Layered plates and buffalo check napkins were perfect for a backyard barbecue! I love to use simple white platters, bowls, and galvanized trays when serving the food, so it can pop! Plus, the neutral colors mean it will always match my color scheme! 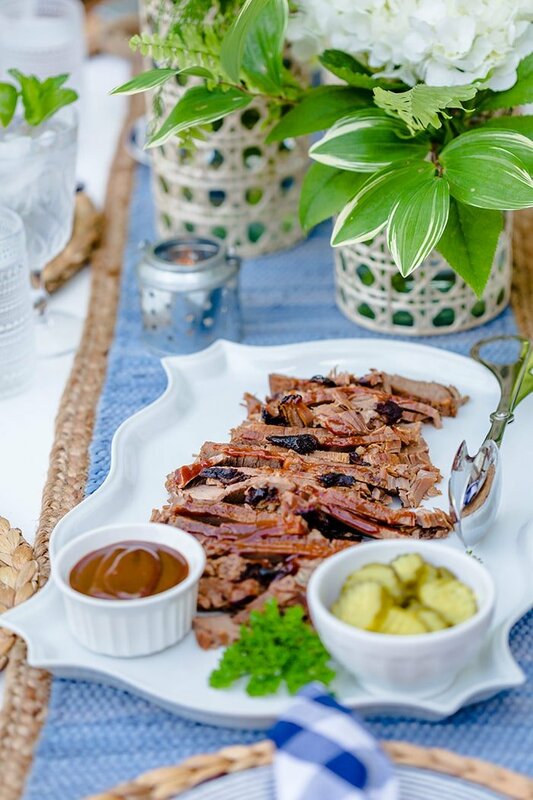 You’ll notice my drool-worthy beef brisket on a simple platter with a bowl of extra barbecue sauce and pickles. Look for little ways to make the tablescape more special. For example, right before the party, I clipped mint from my garden and added to everyone’s water. The table smelled amazing! Now that you have the main dish and tablescape down, let’s chat sides and sweets. Keep it simple and use seasonal fruits and vegetables. 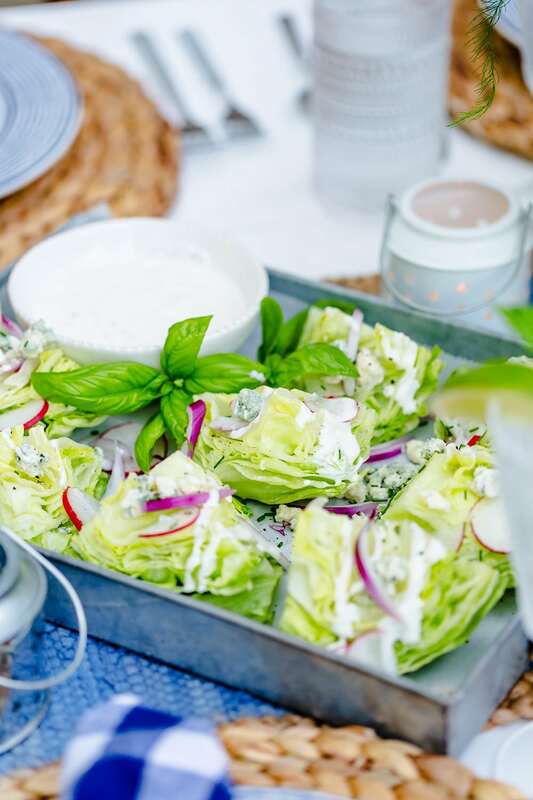 For a simple side dish, I served up mini wedge salads. They’re perfect for parties! You can easily take a typical side dish and serve it up in individual portions. For dessert, let seasonal berries be the winner! Add them on top of vanilla ice cream or make a fruit pie. It’s the perfect complement to a barbecue! You can’t have a party without music! It relaxes guests and sets a festive atmosphere for everyone. Create a playlist and let it shuffle or loop throughout the party, so you won’t have to fuss with it. Anything you can do in advance will help you out on party day! Create that playlist a few days before the party. Cut veggies and fruits in advance. Prep your beef in advance. Set your place settings inside so you can easily transport to your table on party day. However, you can help prepare for your barbecue party ahead of time will mean more time to relax and enjoy the occasion yourself! If you choose to have kids at the party, be sure you have some activities to allow them to let loose and have fun. This also means their parents can enjoy the party a little more as well. As the parent of a four-year-old, I love when the party hostess has a few games or activities for little ones. Think badminton, arts & crafts, water guns, and even cards! Your guests look to you to set the mood for the party. 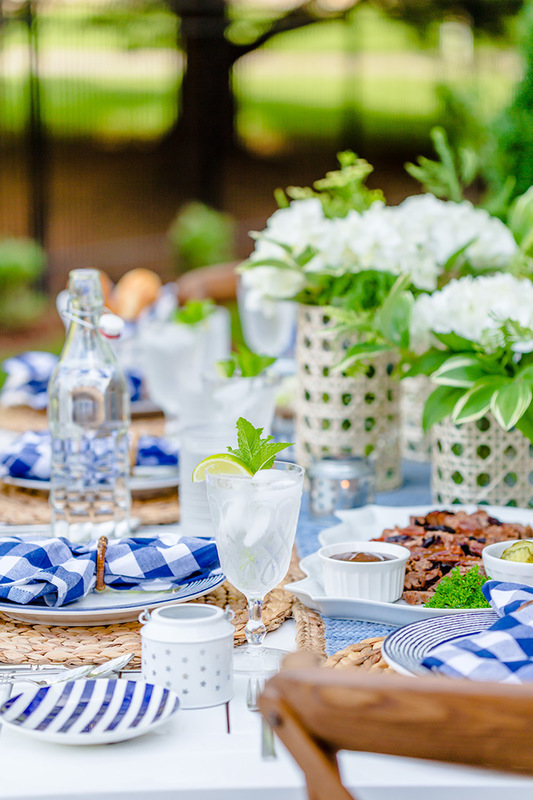 Stay calm, cool and collected by following the tips above (especially #6) and you’ll be well on your way to making your summer barbecue an annual affair! 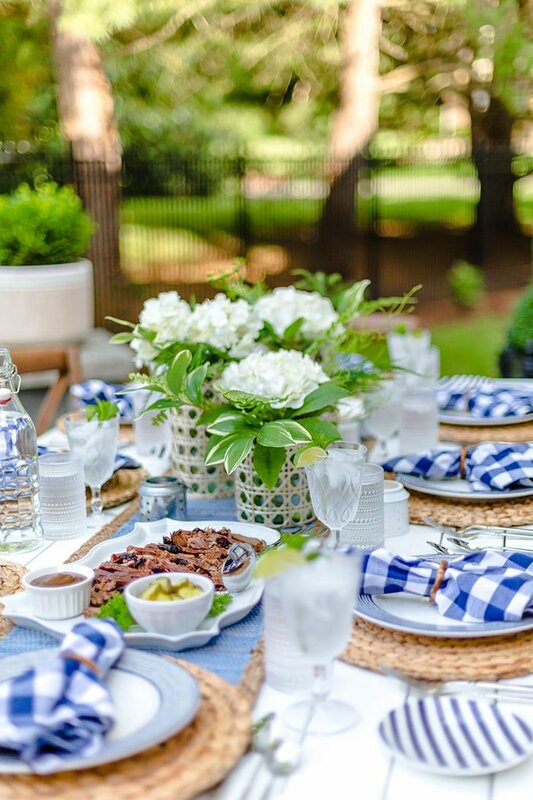 I hope you’re inspired to throw your own amazing backyard summer barbecue! You can’t go wrong with good friends, GREAT tasting beef and warm weather! Visit www.BeefItsWhatsForDinner.com/nutrition for more recipe and summer grilling inspiration! As always you make throwing a party look so beautiful and easy. Love these tips and how they break things down. The brisket sounds delicious and love the white a blue color combination. Definitely feel inspired! You always have the best recipe ideas! 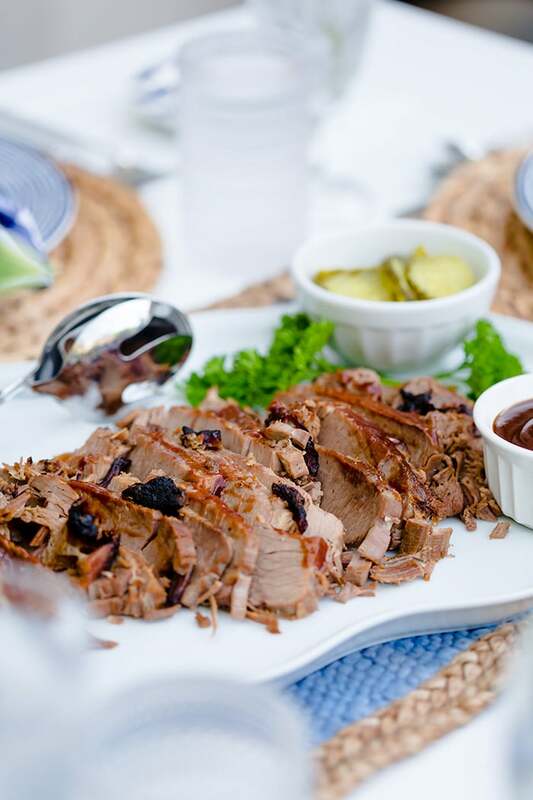 I love this brisket for a summer party yum! As always your tablescape and tips leave me inspired! Okay first off—i am now hungry looking at this! The beef brisket looks SO delicious! And second, I have never made it before but now i am motivated to give it a go FOR SURE! This makes me excited to do a summer bbq with friends! Your sharing always influences me because there mentioned recipe is making very easily. The dish seems delicious. I must try this with amazing taste. Thanks for sharing all the ingredients. It is so easy to make and also very healthier.